Here is a link to the report, https://circle.ubc.ca/bitstream/handle/2429/19940/Natalie%20Melaschenko_M.Sc.%20Thesis.pdf?sequence=1. For more details, see http://a100.gov.bc.ca/pub/siwe/search_process.do?sortOrder=0&projectID=4716. Objectives The objectives of this study were: 1) to determine the effects of cheatgrass on small mammal abundance and habitat use; 2) to use fractal analyses of path tortuosity to assess the spatial scales at which mice perceive their environment and; 3) to determine the role of vegetation and population density in shaping movement patterns. Trapping and tracking were conducted in 2008 in the Okanagan Valley of British Columbia at the northern reaches of the Great Basin ecosystem on 12 sites spanning a gradient of cheatgrass cover. Habitat use and movement patterns were delineated by powdering mice with fluorescent pigment and following their trails. Project Location DescriptionThis study was conducted in the South Okanagan Valley in British Columbia between May and November 2008. Twelve study grids were established: three at White Lake, three at the Vaseux-Bighorn National Wildlife Area and six at the Haynes Lease Ecological Reserve. Abstract This study determines the role of vegetation in shaping individual habitat use, tortuosity of movement patterns and patterns of population density of western harvest mice (Reithrodontomys megalotis), Great Basin pocket mice (Perognathus parvus) and deer mice (Peromyscus maniculatus) in British Columbia’s Okanagan Valley. The former two mice are considered at risk in British Columbia due to loss or alteration of native habitat by human development and invasive species such as cheatgrass (Bromus tectorum). The objectives of this study were: 1) to determine the effects of cheatgrass on small mammal abundance and habitat use; 2) to use fractal analyses of path tortuosity to assess the spatial scales at which mice perceive their environment and; 3) to determine the role of vegetation and population density in shaping movement patterns. Trapping and tracking were conducted in 2008 in the Okanagan Valley of British Columbia at the northern reaches of the Great Basin ecosystem on 12 sites spanning a gradient of cheatgrass cover. Habitat use and movement patterns were delineated by powdering mice with fluorescent pigment and following their trails. In the fall, the average population density per 1-hectare site was 18.0 ± 4.5 Great Basin pocket mice, 0.21 ± 0.08 deer mice and 0.08 ± 0.02 western harvest mice, while in the summer only Great Basin pocket mice were trapped (8.71 ± 3.20). Cheatgrass invasion ranged from 1 to 18 % cover. Cheatgrass abundance was not correlated with the population density of any small mammal species. 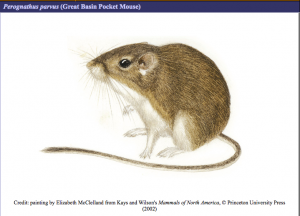 In the summer, bare ground and shrub cover best-predicted Great Basin pocket mouse density, while in the fall bare ground alone was the best predictor. Great Basin pocket mice selected bare, open habitat. Vegetation was avoided with the exception of annual grasses, mainly comprised of cheatgrass, which Great Basin pocket mice selected. Bare ground in combination with cheatgrass may have provided optimal habitat for movement. Great Basin pocket mouse path tortuosity increased with vegetation cover and population density and decreased with open habitat. The fractal dimension of movement pathways was consistent over the spatial scales measured in this study.